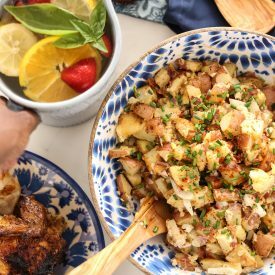 A delicious smoky flavored red potato salad featuring grilled red potatoes, creamy salad dressing and bacon. Cut potatoes into 1/4-inch slices. Toss with olive oil, Old Bay Seasoning, salt and pepper. Bake in the oven for 30 minutes at 450 degrees. After potatoes are tender. Transfer 1/2 of them onto a grill sheet and grill on medium for 15 minutes or until tender and has a smokey taste! Let potatoes cool to touch. Meanwhile, for the dressing, combine mayo, salad cream, mustard and cajun seasoning. Mix well and set aside. After that, fry the bacon until crisp; remove and set aside. Once it has cooled, chop it up along with the boiled eggs and red onion. Pour all the potatoes in a bowl and add dressing,chopped onions, eggs and bacon. Combine gently! Sprinkle smoked paprika on top. Taste and adjust for salt and pepper and salad cream as needed. Serve warm or at room temperature.